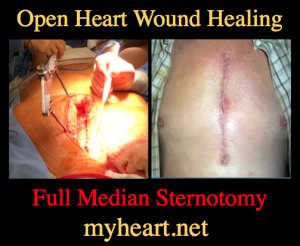 You are here: Home / Heart Disease / Coronary Artery Disease / Open Heart Surgery – Incredible Picture Guide! The most well known open heart surgery is bypass surgery, often known as CABG (coronary artery bypass surgery). That is done to bypass heart blockages. Other well known open-heart surgeries include heart valve repair and replacement, surgery on the aorta , surgery for holes in the heart and heart transplant surgeries. 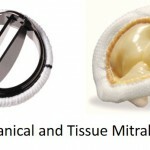 Artificial heart pumps (known as VAD short for ventricular assist devices) are also often placed by means of open heart surgery. In children and adults that have been born with major abnormalities (known as congenital heart disease) multiple open heart surgeries may be required over a life time. These different types of open heart surgery will be discussed in more detail below. 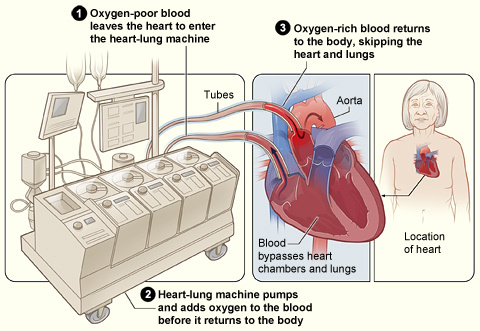 The heart lung bypass machine. The Operation Itself – In bypass surgery, one by one the blocked arteries will be bypassed using vein or artery taken from elsewhere; these are sewed into place delicately. In the case of valve replacement the old valve is cut out and a new valve sewn in. In valve repair, different techniques are used to repair the existing valve. The several different operations are described in detail above or in other articles. 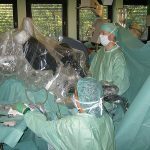 Closing the Chest – After the operation is complete on the heart, the patient is weaned off the heart lung bypass machine and the heart is restarted with an electrical shock. Then the chest incisions are sewn together. In the case of the breastbone, wires known as sternal wires are placed to hold it together until it heals. Very informative. Great article. Some how I think gaining all the knowledge I can on the subject will make what I am dealing with less scarey. I was wrong. I have been looking for information and everything else out there is very basic. Thank you for the detailed articles. This will contribute to my ability to make an informed decision about my treatment when the time comes. Anything on pulmonary vein stenosis in Left superior vein related to CABG? Very helpful, answered many of the questions and releaved most of the stress I had . Liked the attention about the anesthesiologists and how they can calm the patient before the OR. Great article! This is the website where everyone needs to be looking for any information on the heart… easy to understand, yet still comprehensive. Thank you! My sister in law states that the doctor will take her heart out put her on life support fix the 4 blockages 3 in front 1 in back put her heart back in. She is diabetic has had all toes but 2 removed, she is appx 55-56 years old. She has already had open heart surgery about 10 years ago. What are her chances of surviving this operation? 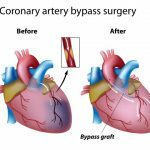 She has misunderstood, there is no way that is going to happen as it doesn’t make sense, yes she would be put on bypass, however the heart is not taken out to perform a bypass as shown in the images in this article. this is very helpful. I had a PAPVC an isolated anomaly, specifically branching of my pulmonary vein. I’m early 30’s and found out about 2 mos ago and am now 4 wks post op. 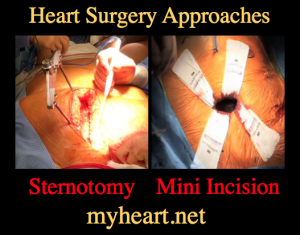 This is a great overview of what was done by my surgeons for the basics. My husband has heavy blue thread coming from incision 1 month after quad. bypass & valve replacement. About 6 inches long. What is it? I think you should get it seen to and make sure it isnt a pacing wire or other retained wire. I was meant to have a quadruple bypass 18 months ago but they could not get to the artery at the back so they used what I remember was a mammory artery instead. Since my op aprox 18 months ago my left breast and my sternum has been painful and my breast is swollen and has stayed like this with no change. My doctor sent me to a breast clinic to get it examined due to its size but came back all clear… I have been back to see my surgeon who has recommended removing the three middle sternum wires as this area has always been tender to touch even 18 months later. 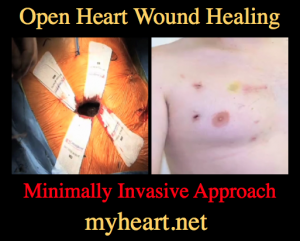 I have now had this procedure done and I am now home recovering…. I was told it would be 3 very small incisions to remove wires and probably home same day all being well. I can honestly say I have never been in so much pain…. It was worse than the bypass surgery and I am really struggling to move my upper body without severe pain…. I mentioned this in hospital but they seemed keen on getting me home as soon as possible…. I feel abandoned right now by the hospital and I definately would not have gone through with the removal of the wires had I realised how painful it would be. One thing I forgot to mention was that they reopened the whole chest rather than 3 small incisions ….. Upon reading my own previous comments I would also like to add that obviously without the bypass operation in the first place I probably wouldn’t be here to tell the tale and it is not my intention to worry any future patients but merely to say that everybody reacts in different ways. I will always be grateful to the surgeons & staff at NHS for the hard work they do and I accept this wasn’t portrayed in my earlier comments. We have some of the best surgeons in the world here in the uk and I am truly thankful for everything they have done for me personally. I’m glad you are doing well. My mother is currently recovering from a bypass that is why I’m on the web searching all I can. Did your incision feel rough to the touch? Hers feels rough not smooth. Not sure if it’s the stitches or the roughness of the bone I’m feeling. Thank you for this. Now I don’t feel so crazy about how my incision makes my left breast and left shoulder feel so sore. I had quadruple bypass on 09.15.17 and it is still sure now. It kind of feels like some days it hurts all day and on some days it’s not too bad. A lot of times I can’t sleep because it hurts. I will be continuing following this thread to see if more people are experiencing what I am. Thank you for your experience, it was very helpful. I had quad bypass surgery in 2010. I still have some nerve damage on my left side but its not bad. Some days it itches like crazy. I also have a small hole in my chest on my surgery scar. My dr said not to worry about it so I haven’t. Every now and then I’ll squeeze it to get the white stuff out but it doesn’t get infected or anything. Thank you so much for these articles. As a heart patient all my life, I can tell you anxiety can make it difficult to retain what you are being told. I had an awake minimally invasive valve surgery, and I wasn’t intentionally trying be uncooperative, but my anxiety didn’t allow me to think rationally. This time it will be an open surgery. I met my surgeon last week and feel very confident and safe in his hands. However, when he explained the procedure, after he got to the part where he told me he will put tubes in my heart and drain the blood, I have no memory of our conversation. Fear sets in. So, this is just the explanation I needed. Geez Louise I wouldn’t wish being a heart patient on anyone. I had my surgery done on July 5th 2017. They took a vein from behind my heart instead of the leg. They then replaced the complete aorta (6 inches)and aorta valve and the left coronary by-pass. About a 5 hour job.They gave me NO pain meds but lots of drugs during surgery that took about 11 days to clear my system. I feel great except for the cough and slow rib recovery. This was very informative. I wish I had seen this before my surgery. Had no idea what to expect. 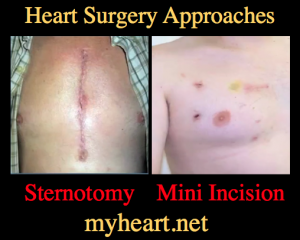 I had an ASD closed using open heart surgery in December 2017. They tried to close it doing a cath, but didn’t work. 5 weeks after surgery, still some discomfort in sternum, but feeing great otherwise. Hopefully I won’t have any problems with sternal wiring in the future. That is my main concern. Thank you Dr for this article and these incredible pictures.I left the hospital 2 days ago after undergoing a 5 bypass operation. In 6 weeks I went from a couple of pains to this wonderful recovery. If they had shown me this article beforehand I think I’d have been far less worried, but of course people rarely react how we think they will.LOL Some prefer knowing less. Again, thank you Dr for showing me in these INCREDIBLE moving pics exactly what a highly trained team of doctors and nurses and technicians helped me survive. Age 59 and still kicking. I had the bypass surgery with harvesting the veins from the left leg. After the bypass they kept the heart lung machine on until the heart stabilized for a minute or so. Before the operation they told me that 10% die in OR, another 25% have a stroke and my require a longer stay, 10-15% may get an infection, and 10% may get pneumonia. The a six week recovery with no exercise, then an extended recovery period. I had a triple bypass December 2018. I am doing fine so far, 5 weeks post surgery. Tiny bit of pain, almost back to normal. Just a little weak and I tire easily. I am a young 80 years old, very active, and want to know how long before I can drive, and do normal things like shovel snow on my walkway, basic carpentry & home maintenance, things that I did before surgery. Or am I always going to be limited in what I do for the rest of my life? These questions are different case by case and should be answered at first post op follow up. Hello Doctor Ahmed, I had a Double Bypass in 2004 and 2 stents in 2017. I have now developed a soreness in my chest when I breathe deeply, or make any arm movements. I have a continuous aching feeling in my chest. It feels as if my muscles are sore continuously. My General Practioner says it is muscular (arthritis?). With what can I treat myself to relieve the soreness? I was life flighted to a hospital to perform an emergency aortic dissection and aneurysm on January 16, 2019. I am 70 years old and was about 40 pounds over weight. I will be home for for the Super Bowl tomorrow (go Rams). I was at the hospital for 12 days. Rehab for 5, mainly due to my wife having to go out of town for other family concerns.I have a little pain in the chest and with some deep breathing, but able to take care of my personal needs and walk, using a walker just in case. The most important part was being able to get to the correct trauma in time. Thanks to the skilled surgical team. After bypass surgery, will the sternum grow back together? It’s wired , but will it be the same as before the surgery?thank you. It heals yes to most extent. I had triple bypass in june of 2018. After surgery I found that my right nerve to my lung was damaged or cut somehow> now after pulmonary rehab it has yet to move my diaphragm. So I use oxygen and inhaler and now neubulizer to get by day to day. Was never told about this being a possibility of happening. Why is the warfarin not working, did they feel you’re resistant? Has an issue come up with the actual valve itself?